Purchase Vinyl: http://goo.gl/k5k8UG Purchase Digital: http://goo.gl/wUcG5s BM/CC/CW’s Spectrum debuts the collaborative works of three New York g’s: Brendon Moeller, Clay Wilson and Oliver Chapoy aka Certain Creatures. Inspired by each other’s live performances at an Industry of the Machines party in May ‘14, Brendon, Clay and Oliver re-convened for an impromptu recording session a week later. 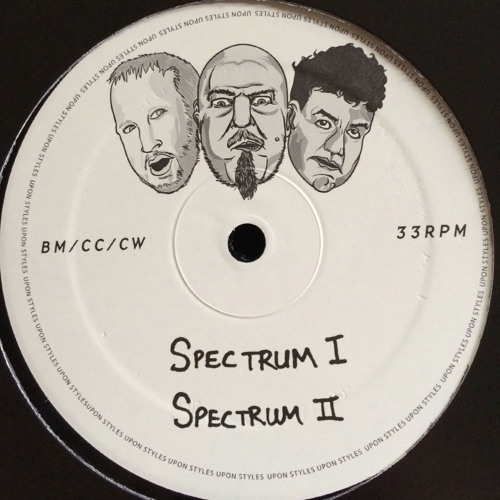 Spectrum culls three serpentine heavy-weights from that session. Each track warps modular meltdowns into aerobic feats of primed DJ mayhem, mixing the visceral with the psychedelic for a twisted take on techno. “Spectrum 1” peels queasy melodies off charburned, disintegrating toms that disappear into the howling vortex of “Spectrum 2”. The third and final (for now) “Spectrum” emission channels the most harrowing moments of the trio’s live performances - a deliberate, free-form exploration of techno’s widest fringes and wildest possibilities. BM/CC/CW’s three wormhole workouts come to life on November 4, 2014.